The exciting coin sculpture I designed last year with a small team from Paper Moose has won the prestigious CREATE Design Project of the year award for 2015. A huge thank you to them for the award. What did the process for deciding upon the coin motif involve? The initial project brief was to develop a concept to draw attention to recycling kiosks the City of Sydney were installing around the city. We thought a sculptural installation using recycled bottles would be a cool idea, and it didn’t take long to decide that using the 10 cent refund motif (which was a core part of the campaign) was the way to go. What are the key points of inspirations, or the underpinning principles for the direction you took? Clarity, scale and boldness were the key principles. Could we make this thing big, could we make this thing bold, and could we make it stand out? How did you develop the visual language (in terms of research, selecting materials etc) for the sculpture? The visual language developed fairly naturally from the choice of materials. Knowing we needed a rigid frame to hold over 1000 recycled bottles in a perfect grid, we knew we would be using some kind of laser cut metal (in the end, mild steel). We put the coin on a slight angle, to create a kind of impossible lean. For a sculpture that weighed over a tonne, this was no small feat. We had a few engineers carefully calculating wind loads to help us devise a a way to build the frame so it was strong enough to survive freak storms. We created a plinth for the coin to sit on for two reasons: one so that it presented as a sculptural object, and second as a space to house the electronics and the tonne of ballast it required. What were the biggest challenges involved in the project, and in building the sculpture? It was an incredibly challenging project, from a budgetary standpoint, but also from pure logistics, design, and assembly. The entire structure was laser cut, but then had to be painstakingly hand-welded together. The front disc structure by itself for example is made up of 7 steel sheets that were meticulously joined. Each bottle (1,200 of them) then had to be coloured and installed in the frame by hand. We took creative and financial risks in developing this concept along with our fantastic clients, the Zero Waste team at the City of Sydney, and we think it paid off. We created a striking installation by turning used water bottles, objects normally associated with ugliness, into something beautiful. Then we then backed it all up with an important message: that #recyclingpays. The Lumo Lift is a pretty neat posture and fitness tracker. I thought I'd open it up for the sake of design to find out what makes it tick. The shiny metal thing in the middle covered with tape is the button mechanism. The cylinder on the underside is probably an eccentric rotating mass style vibration motor. The outer wall thickness of the unit is 0.7mm and that inner wall lip is 0.4mm (pretty thin! I actually damaged it opening it up). The inner lip's function is to mate the main casing to the lid, so the whole unit can be pressed like a button, which is pretty cool. The PCB is also surprisingly only 0.4mm thick - it actually flexes it's so thin. I love how the magnet that mates the unit with the dock has to work through the PCB and battery to make contact, perhaps this is part of the reason why the PCB is so thin? Overall the design is simple and elegant, but opening it shouldn't break it, so perhaps it's a little too delicate. Overall, it's a pretty cool design. Prototype parts for a secret project I've been working on have started to come in. I really want to show you more, but for now this will have to do. Pictured below left is a CNC machined aluminium prototype of what will be a sand cast component, accompanied by some steel core braided ropes. You can see them assembled to the right, along with laser cut stainless steel panels and a new HDPE prototype part that acts as a sort of bridging connector for the assembly. Previously we were using rubber, but found it was too weak to deal with the loads it was taking. More updates soon. A small team from Paper Moose and I were nominated as finalists for the prestigious B&T 30 under 30 awards for our giant 10 cent coin sculpture erected at Circular Quay last year. At 3.8 metres tall, and constructed from more than a thousand recycled bottles and 300kg of laser cut steel, the coin sculpture was built to help promote a new 'cash for containers' scheme that would see 10c from every bottle being returned to the user when recycled. Such a scheme would reduce bottle litter significantly in NSW. We were hugely honoured to be included in the prestigious award list. You can read more about the coin project here. I was interested in how the size of the new universal USB-C connector compared with Apple's existing Lightning connector, so I looked up the dimensions and drew up the graphic below. I also included a standard USB type A port for reference - you can see that USB-C and Lightning are quite similar in size. I was also interested to see whether Apple might use USB-C in the next generation of iPhone, especially considering new rumours regarding the removal of the headphone jack, so I have included an overlay over an iPhone 6 wireframe. As 9to5mac point out in this article (where they link this graphic), the USB-C port is about the same height as the headphone jack, meaning little would be gained by switching to a USB-C only solution. This could mean that USB-C might remain Mac specific, and Lightning might remain iDevice specific - which would make sense in order to avoid breaking compatibility with the entire ecosystem of Lightning accessories. Edit 05/11/2018: The 2018 iPad Pro now comes equipped with a USB-C port. This means the chances of an iPhone eventually adopting USB-C have increased significantly. I'm working on something very exciting.. 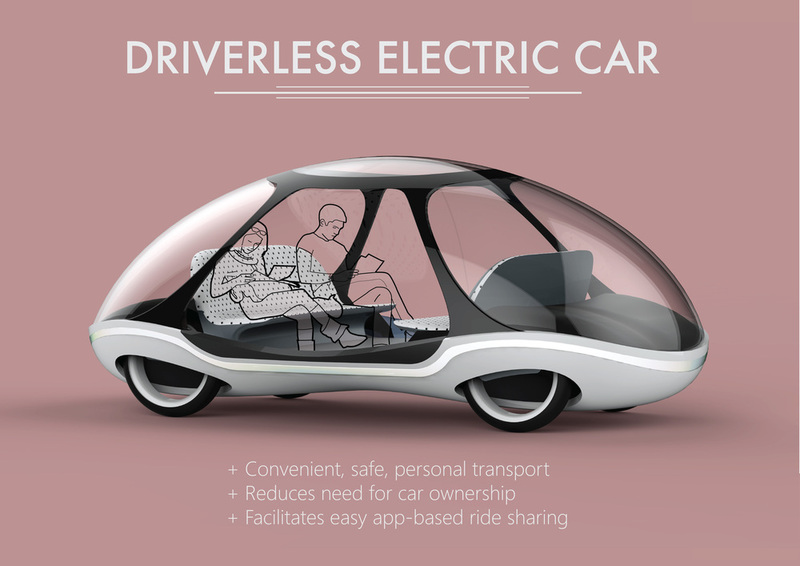 Note: This project was developed only months before major driverless car concepts were unveiled by Mercedes and IDEO. This project was designed to determine what a driverless electric vehicle could look like without the bulky interfaces required for human control. The concept developed heavily around the premises of increased safety, comfort and sociability that automated systems provide. The collaborative consumption model the design focuses on is an automated 'swarm' fleet model which can be interfaced through smartphone APIs. I would like to pay tribute to a similar concept from 2007: Ross Lovegrove's 'Kyoto Concept' vehicle, pictured below. It is humbling to discover a similar vision from a world renowned designer. For more on this design project, click here. A sculpture I designed with a small team at Paper Moose has recently been installed in front of Customs House at Circular Quay, Sydney. The design process was a fascinating exploration of materials and manufacturing techniques, extensively making use of laser cutting and welding of the carbon steel components. See the project page here.